Facebook has officially made its move into mobile advertising after announcing that 53% of its $2.59 billion in advertising revenue came from mobile in Q4 of 2013. This translates to $1.37 billion from 556 million daily mobile users and 945 million monthly mobile users in that quarter alone. 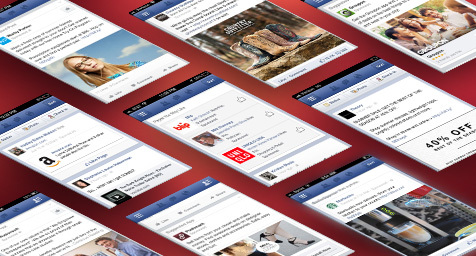 Techcrunch.com reported on how Facebook has evolved into a mobile advertising authority. Realize that mobile accounted for only 30% of Facebook’s ad revenue in the first quarter of 2013 yet jumped to 49% of the company’s ad revenue in Q3 of 2013. But this marks the first time that the majority of Facebook’s ad revenue has come from mobile, as well as their first billion-dollar mobile ad revenue quarter. It appears that Facebook earned almost as much from mobile ads in Q4 of 2013 as it did from both mobile and desktop ads in Q4 of 2012. Many attribute this mobile momentum to Facebook’s mobile app install ads that have helped developers promote their apps beyond the cluttered and crowded app stores. Another business booster was Facebook’s new mobile app re-engagement ads that have brought users back to the apps they had downloaded and disregarded. Advertisers realize that Facebook offers outstanding insight into users’ patterns and preferences due to the abundance of data it collects. As a result, the social media site can show tightly targeted and highly relevant mobile ads that deliver strong rates of response and return. This has led to a total revenue increase of 65% or more over the year in every geographic region. Facebook clearly has its finger on the pulse of mobile advertising and keeps proving its power to keep brands at users’ fingertips. Get the latest updates on mobile advertising and social media. Contact MDG Advertising today at 561-338-7797 or visit mdgadvertising.com. MDG Advertising is a full-service advertising agency and one of Florida’s top branding firms. With offices in Boca Raton and New York City, MDG’s core capabilities include branding, logo design, print advertising, digital marketing, mobile advertising, email marketing, media planning and buying, TV and radio, outdoor advertising, newspaper, video marketing, Web design and development, content marketing, social media marketing, and SEO. To discover the latest trends in advertising and branding, contact MDG Advertising today at 561-338-7797.